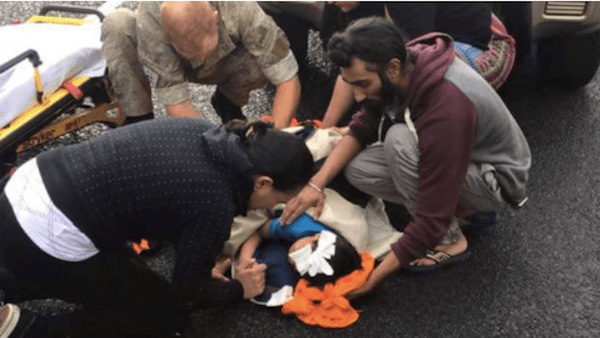 Harman Singh did not think twice about removing his turban to cradle the bleeding head of a 5-year-old who had just been hit by a vehicle on his way to school in New Zealand, reports The New Zealand Herald. Members of the Indian community last night praised Mr Singh for his action, considered a hugely significant act of humanity by breaking strict religious protocol to help a stranger, the report added. Perhaps the bit on ‘ breaking strict religious protocol’ in the NZ Herald may not be accurate, but the newspaper certainly found the incident worth reporting. In March 2015, the same newspaper had a couple of stories on Sikhs revolving around the issue of wearing of kirpan at the3 New Zealand Cricket World Cup venues. See, for example, Sikhs take kirpan complaint to rights commission (17 March, NZ Herald). The accident occurred in Manuroa Rd just before 9am. Mr Singh acknowledged the rare step he took to help, but said that protocols of his faith did not restrict certain actions in an emergency. Mr Singh and other members of the public stayed with the boy until emergency services arrived. They told him he was going to be okay. Not long after the accident, the boy’s mother arrived. Gagan Dhillon said he was on his way to work when he saw the accident and stopped to help. “There was enough help as there was, but being a Sikh myself, I know what type of respect the turban has. People just don’t take it off – people die over it.